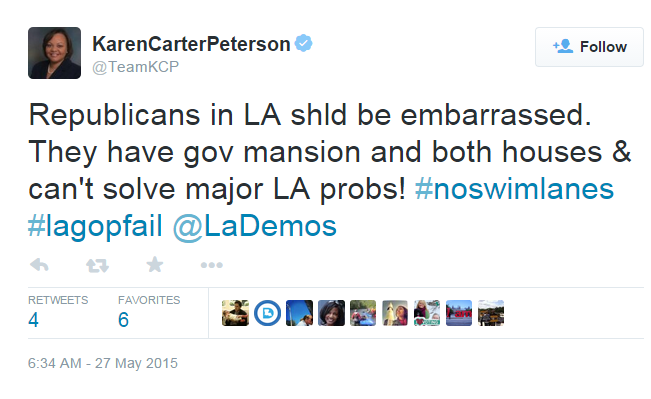 Louisiana Democratic Party Chairwoman and State Sen. Karen Carter Peterson (D-New Orleans) took to Twitter today to slam the LAGOP for failing the state over the last couple of years. What is so ironic here is that Peterson has all but driven the Louisiana Democratic Party to extinction under her leadership. (She’s had some help, as we’ve noted recent examples of the dopey quality of Louisiana pols here and here today.) And even if readers agree that Republicans have failed the state over the years, what has Peterson done this session to solve major problems in the state? SB10: This legislation by Carter would enact a constitutional amendment which would provide health insurance to every legal resident of the state whose income is at or below 138 percent of the federal poverty level. This legislation would essentially be Obamacare for Louisiana. SB25: This legislation by Carter is a local bill for Orleans Parish and would not have any impact on the state’s larger problems. SB44: This legislation was withdrawn by Carter. It would have automatically registered Louisiana citizens over the age of 18 years-old to vote. This would not have had any impact on the state’s larger problems. SB74: This legislation by Carter would repeal the Louisiana Science Education Act. This would not have an impact on the state’s larger problems. SB81: This legislation would require employers to give workers paid sick leave, enacting more business regulation by the state. SB84: This legislation by Carter would created the Louisiana Family and Medical Leave Benefits Act, enacting more government regulation on employers. SB258: This legislation by Carter would automatically register Louisiana citizens over the age of 18 years-old to vote. This would not have had any impact on the state’s larger problems. Aside from these seven pieces of legislation, Carter has filed seven condolence and recognition resolutions that will acknowledge particular events and individuals in the state. 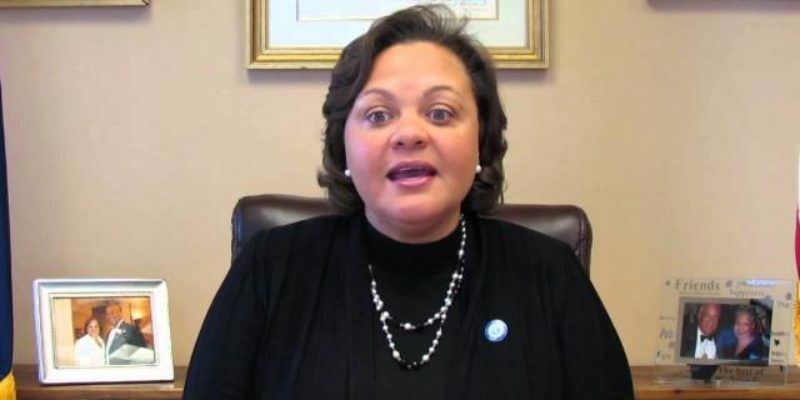 Next Article After Cheerleading For Tax Hikes, Why Does Lance Harris Want This Particular Tax Cut?